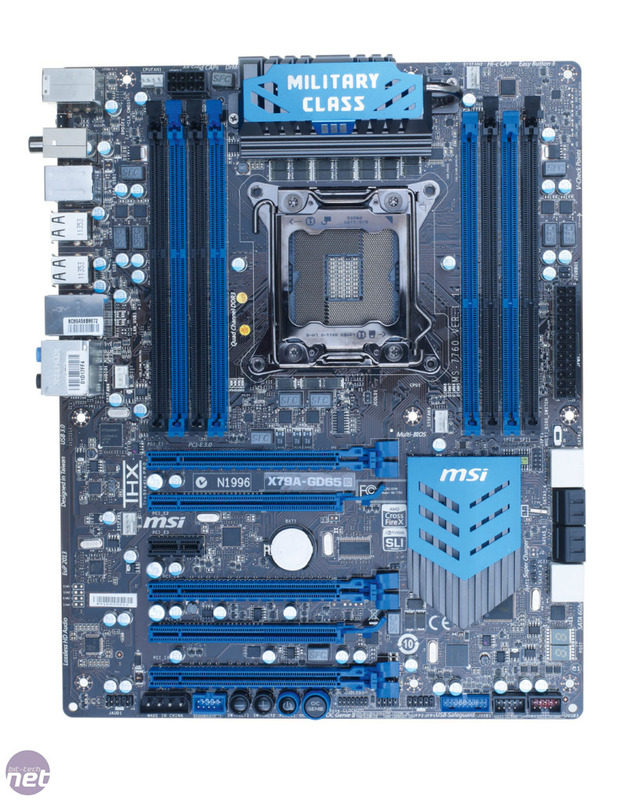 We’ve given MSI several awards for its motherboards over the past year or two, and its P67A-GD53 (B3) was one of our favourite P67 boards. 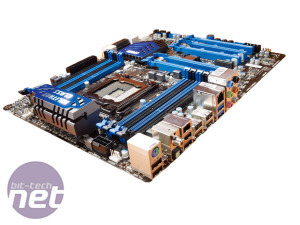 It costs around £100 but is still one of the best P67 motherboards we’ve seen. 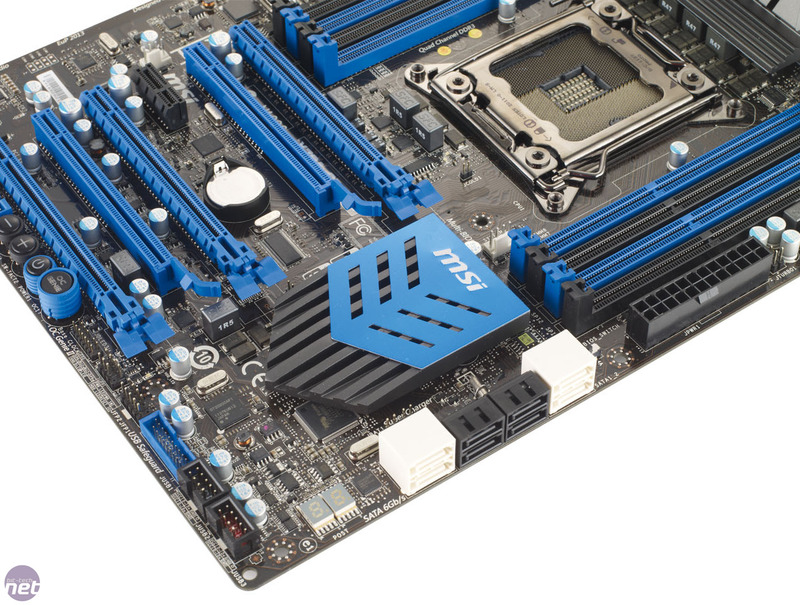 Thankfully, the company was also able to get an X79 motherboard out of the door and into our Labs, and while the X79A-GD65 (8D) isn’t the most memorable name for a motherboard, it’s certainly not lacking in features. That’s just as well considering its £243 price; only Asus’ Rampage IV Extreme and Sabertooth X79 boards are more expensive. Unlike the ASRock X79 Extreme4 and X79 Extreme4-M on test, the GD65 (8D) sports eight DIMM sockets, meaning that it supports the maximum number of sticks of RAM. 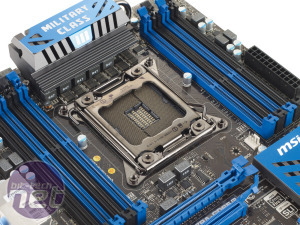 However, while boards such as the Sabertooth X79 also have eight DIMM sockets, it can accept a maximum of only 64GB of DDR3, whereas the GD65 (8D) supports up to a crazy 128GB of DDR3. Even 64GB is four times more than you realistically need, even for heavy photo and video editing. The feature list doesn’t stop there though. 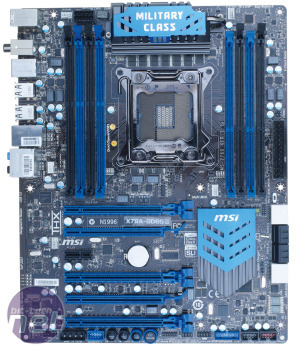 As you’d expect from a premium MSI board, the X79A-GD65 (8D) is equipped with an on-board power button, and MSI’s OC Genie and Direct OC Buttons. OC Genie allows for a degree of automatic overclocking, while the buttons give you the ability to adjust the CPU Base Clock frequency on the fly. There’s also a POST code readout and what MSI calls a Multi BIOS Switch. This switches between the motherboard’s two EFI chips, which is handy if things go awry during an EFI update. It isn’t quite as nifty as Asus’ USB BIOS Flashback though, which automatically detects EFIs on a USB stick and flashes the EFI without needing the PC to be powered on (or even have a CPU installed). The GD65 (8D) is equipped with eight SATA ports; four of these are SATA 6Gbps with two via the X79 chipset and two more via an ASMedia ASM1061 controller. This should be plenty for SSD owners, although you should continue reading to see how the ASMedia controller performed before you plug your 500MB/sec SSD into one of its SATA ports. Other interesting additions are an Intel 82579V Gigabit Ethernet LAN port – which is certainly more desirable than other makes – and a healthy complement of USB ports. Twelve of these (four via the I/O panel) are USB 2, while two USB 3 are ports provided on the I/O panel and a further two provided by an on-board USB 3 header. 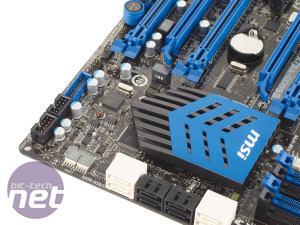 Of the five 4-pin fan headers included, none is located in the lower quarter of the PCB, which isn’t ideal if you have fans located in the bottom of your case. If you’re thinking of installing more than one graphics card, you’ll be pleased to hear that two of the GD65 (8D)’s PCI-E 3.0 slots provide the full 16x lanes, with the third providing up to 8x. 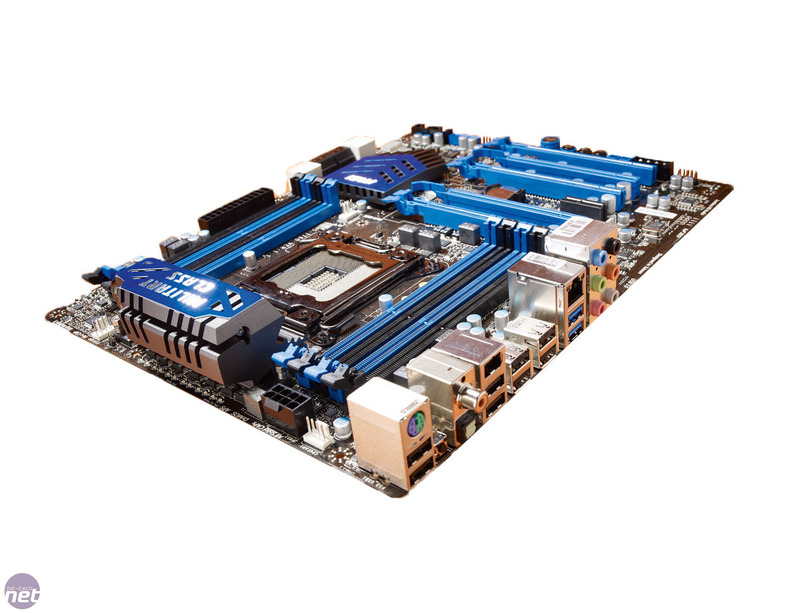 Two 16x PCI-E 2.0 slots are also included but these provide only one lane each. 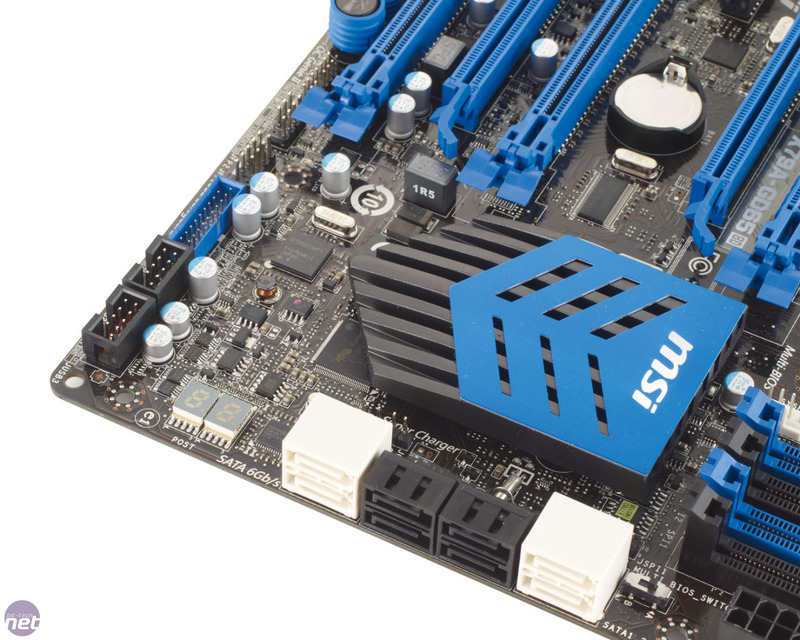 A single 1x PCI-E slot provides an additional means of hooking up devices such as sound cards, but there are no PCI slots. The slots are well spaced for all kinds of configurations, with plenty of room left between the first and second PCI-E 3.0 slots for dual-slot graphics cards. 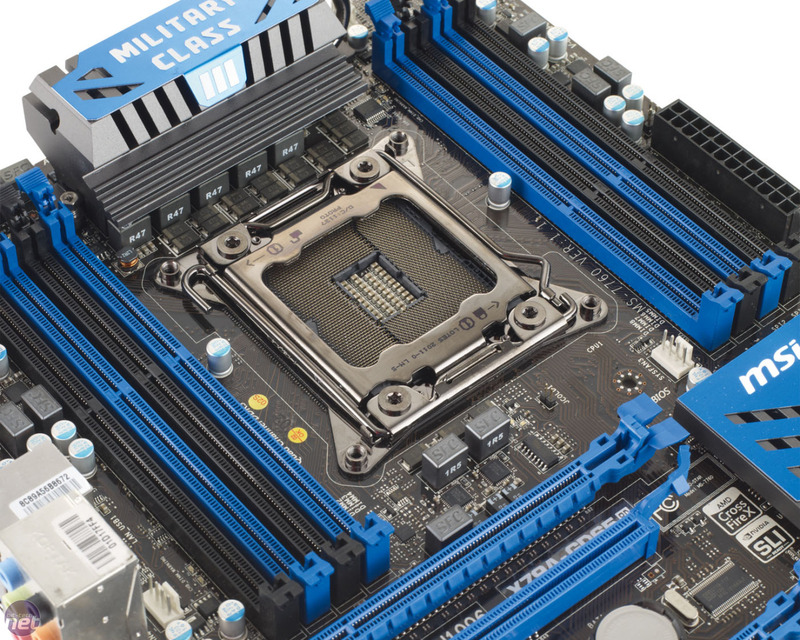 Layout is good on the whole too, with right-angled SATA connectors and power connectors located at the edge of the PCB and very little to get in the way of CPU waterblocks around the CPU socket too. Killer network chips, Gaming Device Ports. EVGA has posted an image of what appears to be the final design for its dual-socket LGA2011 SR-X motherboard.